Kind on the skin, these specially woven Muslin Cloths are made from 100% cotton. These cloths help to gently exfoliate and improve blood circulation, cleanse and tone leaving the skin exceptionally soft, smooth and better prepared for the application of serums and creams. Effectively removes dead skin cells as it stimulates circulation. Provides thorough cleansing as it decongests skin. Softens and conditions skin when used with the Eve Lom Cleanser. Three muslin cloths should be used in rotation. Wash at 40 degrees after every 2-3 uses. 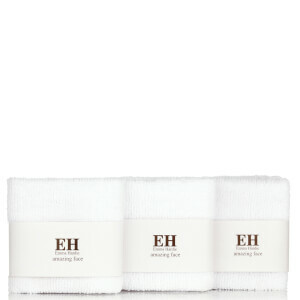 We recommend purchasing an extra pack of Muslin Cloths with every 100ml and 200ml cleanser purchase.